Sacramento Production & Lighting (SPL) supplied both LED and discharge lighting gear from Elation Professional for Sacramento Mayor Kevin Johnson’s State of the City address held at the Sacramento Memorial Auditorium on Feb 12th. 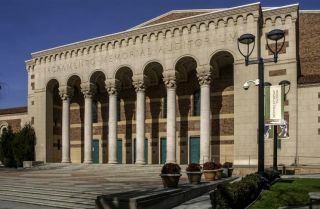 The 3800-seat multi-purpose venue is over 80 years old, and reopened in 1996 after a thorough renovation. SPL chose to light the historic stage, curtain and columns using Elation Platinum Wash ZFX Pro and Platinum Spot 15R Pro moving heads, as well as Elation Design LED Strips and Opti QA PAR lights. “We are an Elation house primarily because of cost and road durability and used the Elation gear on the State of the City address to augment the venue’s existing house lighting system that consisted of a front truss only,” stated SPL’s Dion Cook, who served as Show Director/Caller for the event, as well as assisted on lighting design. Lead designer for the event was SPL’s Dustin Hollingsworth. Pre-address openers included a local band and DJ who also supplied the walk-on and walk-off music for the dignitaries. The Platinum Wash ZFX Pro moving head washes and Platinum Spot 15R Pros were placed on the first batten and used as hair and rear lighting for the band, while the Design Strips were used for uplighting below the video screen and as curtain warmers to give added depth to the speaker when on camera. The Opti QA PARs provided additional uplight on the ornate columns flanking the auditorium’s proscenium arch while Opti PARs were used in a side reception hall along with lekos for ambient room light and texture. SPL client and designer of the event was Mary Daffin of Ms Mary Designs, who has used Elation gear to add a dynamic lighting element to a number of top events in the area.